Once you have determined that your baby needs a schedule change, it is time to figure out how you are going to go about it. You can slowly change your schedule and ease your baby into it. This takes awhile, and honestly (if baby truly needed a schedule change) this method was not needed for us. We always just dove in head first. We changed the schedule and just gave it a shot. If it didn’t work out perfectly (which it never does), I simply tweaked it along the way and made adjustments until we figured out the perfect schedule. 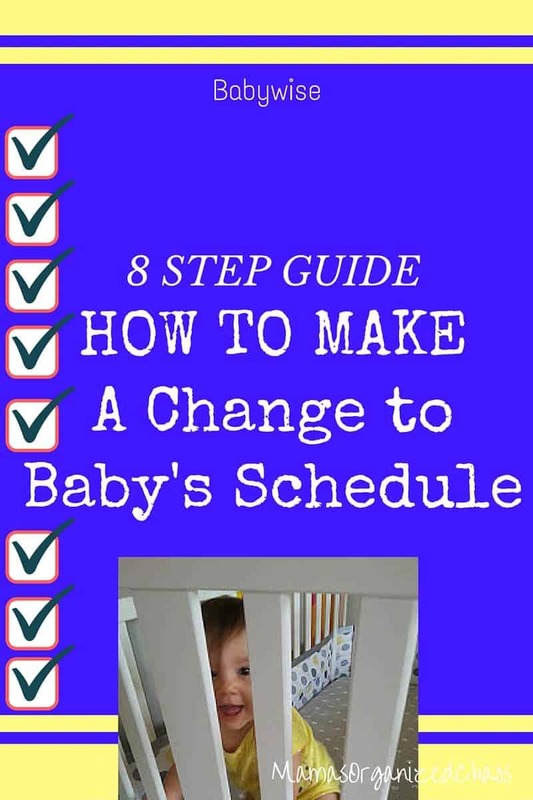 As you are noticing that your baby is going to need a schedule change, look at the resources available to you (Babywise book, our baby schedules page, and any other example schedules you’ve found), watch your baby’s cues and try to figure out the scheduling changes that need to be made. Since you are making a schedule change, you are most likely dropping a nap. Drop the last nap of the day, and rearrange the schedule to accommodate with longer wake times, one less nap, and one less feeding. I always referenced these average sleep charts as well to make sure we were headed in the right direction. Challenge your baby to try the new schedule. Help her by keeping her distracted during longer wake times. Do the best you can to truly try the new schedule. If you are off slightly on the times, don’t worry- just attempt it the best that you can. Is your baby handling the change well? Are her naps getting longer? Are they still short? Are they even shorter? Is she overtired? Too stimulated? Does she seem like she still needs more wake time? Take note. This is the most important step. Look for the cues, interpret them using our frequently asked Q&A page, and trust your instincts. Make minor changes to your schedule as you see fit while you are implementing your plan. Give your plan some credit though, and just make minor tweaks. You know what you are doing, so trust yourself and give your schedule a good 2-3 days of implementation before making any major changes. It may take a few days for your baby to get the swing of things. If you are noticing after 2-3 days, that things just aren’t going as planned, make changes to your schedule accordingly. The schedules in the books all look so perfect… don’t forget that each cycle doesn’t have to be the same length. Do what works for your baby. Make the adjustments that you see fit. Repeat the above process until you feel that you have achieved a good schedule. If at any time you feel that your baby has gotten overtired and needs a break from the process, simply revert back to your old schedule and see if it can work for a day or so. This could give your baby the rest she needs to make the schedule change a bit easier. It may also not work- after all you are making a schedule change for a reason- that old schedule wasn’t quite working anymore. So don’t worry if this doesn’t work out. If it does work out, don’t be afraid to have a schedule A and a schedule B. There were plenty of times that we rotated schedules as we were transitioning from point A to point B. In fact, we are currently in the middle of transitioning from 2 naps to 1, and for the last month we have been alternating schedules to help Caroline make the transition more easily. Often times, the old schedule starts to work if it is alternated every few days with the new schedule.